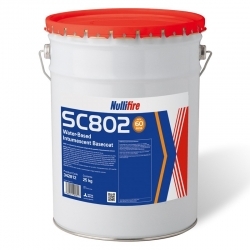 Intumescent paints for steel, structural steel and cast iron at Rawlins Paints are available with 30, 60, 90 and 120-minute fire protection, to accompany fire retardant paints for other surfaces, available here. The intumescent coating products listed on this page are available for interior and exterior use and come in a full range of colours, with full product descriptions available on each item. Most of our fire-resistant paints are easy to apply by brush, roller or spray, with no specialist skills required and fire certificate issued on completion. Click here to find out more information about obtaining a certificate of conformity with your purchase, how to calculate how much intumescent paint you may need for a project or surface/substrate m2 area – meeting the specification required by building regulations - how much protection can be obtained with listed coatings, what the differences are between Class 0 and Class 1 fire protection, and more. Important fire test standards when using intumescent coatings on structural steel constructions are European Union: EN 13381-8 (Replaces national Standards in Europe) and United Kingdom: BS 476-20/21 (Commonly referred to in EU, Middle and Far East). Leading manufacturers and intumescent product ranges, include Zeroflame, Nullifire, Jotun, Bollom, International and Thermoguard. If there is a product you cannot find, please contact our Technical and Sales Support Team on 0113 245 5450. Further Fire Stopping products are now available at Rawlins Paints, including intumescent collars, coated batts, intumescent strips and fire curtains. For further information about this new range from Nullifire[BP1] , please contact our technical support team. What Is an Intumescent and How Does Intumescent Paint Work? Intumescent coatings are passive fire protection measures which swell up when heated (in a fire for example) and protect the material (steel, plasterboard or wood ) underneath it, from fire. As the intumescent layer swells up, it increases its surface volume, which then helps to decrease the intensity of the flames. The top coating produces a light char as it is burnt, which makes it a poor conductor of heat and fire spread. Application of intumescent paint layers helps fireproof structural steel, steel beams, steelwork or cast iron and can be used externally or internally, on small or larger areas. Intumescent coatings are generally available as water-based or solvent based variations (more information below). Under the intense pressure and heat from a fire, most intumescents work by producing a foam-like substance, from the chemicals in it reacting and releasing a vapour. Upon carbonisation, the foam will solidify to a black material (a char), which insulates and protects the integrity of the steel, cast iron, or wood surface. As the intumescent paint expands (sometimes between 50x and 100x the original coating’s thickness) in the event of a fire, protecting the surface from heat, the surface is not burning, but simply undergoing a catalytic chemical reaction. Intumescent paints and coatings are generally used in architecture and in the building of structural steel or timber members. They can provide a decorative and aesthetically pleasing finish on previously exposed steel, as well as keeping the material below its critical temperature to maintain its integrity in the outbreak of a fire or heat explosion. Intumescent coatings can be thinner than technically sprayed fireproofing methods. Unprotected steelwork can reach temperatures of 550°C in a fire, where it then can lose its load bearing capacity and collapse. Building regulations and legislation demand fire protection to upgrade the fire resistance of buildings. Intumescent paint and coatings can be applied by brush, roller or spray, and are generally white or clear (timber only). 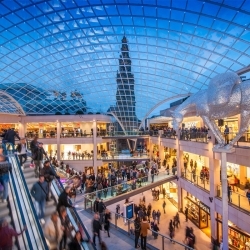 Up to 60 minutes of fire protection can be obtained for timber and dependant on the thickness of the steel, up to 120mins protection can be achieved from applying an intumescent paint system. Intumescent paint is applied in a series of coatings which build up to the thickness required to correspond with the level of protection mandated by the building code. Each product available at Rawlins Paints comes with an in-depth datasheet, outlining application methods, drying time and layer specifications before the top, pigmented to colour, layer is applied. Thin film intumescent coatings usually require a primer to be applied to the steel first and sealer topcoat to finish the system to offer between 30 and 90-minutes fire resistance. 120 fire resisting intumescent coatings are available with some manufacturers stocked at Rawlins Paints. Thick film intumescent coatings are frequently epoxy based. They have a higher dry film thickness and were originally developed for use with hydrocarbon fires. Thick films do not expand as much as thin films in the event of a fire. Thick film intumescent coatings may be used on external steel in high rise buildings, office towers and exposed marine/oil refinery environments. Both can be applied off-site, but this is a specialised task as damage to steel or cast-iron members is possible in transit and erection. The topcoat, or final layer, of an intumescent paint system is tinted to produce the chosen colour and finish, and protects the intumescent basecoat below it. The topcoat / top-seal should always be compatible with the applied basecoat – please contact Rawlins Paints for further information about product compatibility. 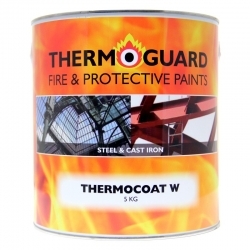 Thermoguard Thermocoat is a low odour, water based intumescent system, which can provide up-to 90 minutes of fire resistance on structural steel or cast iron – this is dependent on the DFT (Dry Film Thickness) the coating is applied at. A (compatible) decorative overcoat can be applied to match the décor and or architectural design features. Thermoguard issue a Certificate of Supply on request for each specified project for insurance, Fire and Building Control Authority and Client Records. Water-based intumescent paints give a smoother finish in a faster timeframe than solvent based coatings. 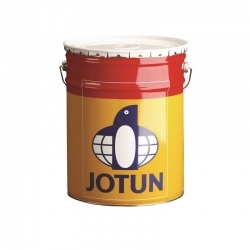 Jotun produce a range of solvent based intumescent coatings for exposed structural steel in areas of high corrosiveness – such as offshore builds, and atmospheric or marine environments. These intumescent coatings also offer fire resistance to structural steel exposed to cellulosic fire. Fire retardant paint for steel and paint for cast iron manufacturers supplied by rawlinspaints.com include Bollom Fireshield and Brosteel Ultra 60, International, Jotun Steelmaster, and Thermoguard Thermocoat. 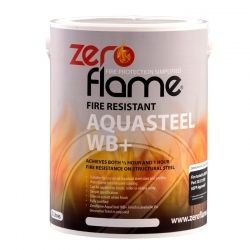 Applying flame retardant paint to steelwork can be easy and we can help you ensure you achieve the protection you require and guarantee yourself a fire certificate. The more information you give us about the steel you must protect, the more accurate we can be with our specification saving you money. 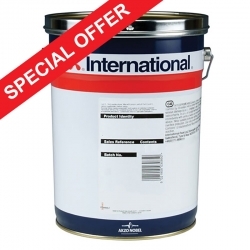 We prefer to speak to our customers prior to them purchasing these intumescent paints to make sure you're getting the right product and are confident of how to use it correctly. Alternatively you can just forward us drawings, fabrication/cutting lists and we'll extract the information from them but in that instance we'd need some guidance as to what to allow for i.e. all steels on first floor, etc. Intumescent Paints either come with an application for, or a link to the manufacturer to request a certificate of conformity for each specified project - for insurance, Fire and Building Control Authority and Client Records.